* Horace, Carmina 3.3.1-8. We have included the English translation by John Conington. Also quoted by H. G. Certon on p. 393. In the year of 1726, when the Sun ascended on the 26th degree of Pisces. Sámuel Fáy (Fáji) was born around 1701 in Miriszló (Alsó-Fehér county, today Mirăslău), the son of the local pastor János Fáy. In 1715 he entered the upper classes in the College of Nagyenyed (Aiud), then he went to study abroad. On May 14, 1726 he immatriculated at the faculty of theology in Leiden, where he was registered as an emissary of Nagyenyed (Coll[egii] al[umnus]). He then settled in Leiden as a teacher, and died here on July 18, 1760. One source, however [Nánási 27] states him to have returned in Transylvania, where he worked as a pastor. Two younger brothers of him, János (c. 1705-1757) and József (1707-1771) also studied abroad, and became pastors in Transylvania. 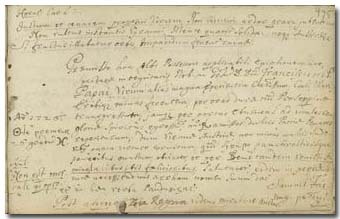 The memento of Sámuel Fáy is the latest one in the album: it was written at the last station on the way back home of the young Ferenc Pápai Páriz, in Vienna, on March 16, 1726. Fáy at this time was setting out to his studies in Leiden. He dated his note by the zodiacal calendar, using the symbols of the Sun (and of the gold), and of the Pisces: “[at the time when] the Sun entered the 26th degree of Pisces”. As the Sun makes the full zodiacal circle of 360 degrees of the 12 signs in one year, thus 30 degrees fall to each zodiacal sign, each degree corresponding to more or less one day. The Sun enters the sign of Pisces on February 19, and therefore it reaches the 26th degree on March 16 (if the year is not bissextile, as 1726 was not). – This same verse of Horace was also quoted in 1719 by Henri Gabriel Certon (p. 393). – The laudatory poems by Sámuel Fáy, István Varga and József Harkányi are included in a wedding print of Leiden of 1728. Varga wrote in the album in London in 1724 (p. 159), we give the bibliographical data of the print at his name.